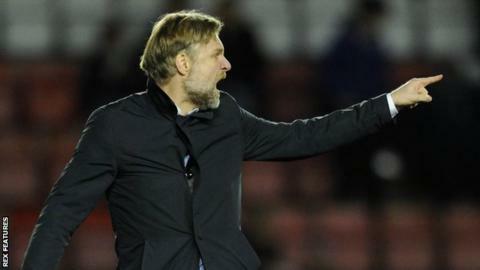 Boss Steven Pressley says Fleetwood are "too anxious" in front of goal after three games in a row without scoring. The Cod Army required penalties to beat fellow League One club Sheffield United in Tuesday's Johnstone's Paint Trophy tie, after the game finished 0-0. "I have said of late that we need to improve in the final third and I think that was evident again," he told BBC Radio Lancashire. "But our organisation and some of our passing showed improvements." He added: "In the final third we are too anxious, we have to believe in ourselves in those areas. At times we try to force the final pass when it is not on and then we don't pass when it is on. "It is just decision making, a little bit of calmness and belief and slowly and surely it will come. "We are working exceptionally hard and over the 90 minutes we are denying teams very few opportunities, but I want to turn these performances into more creative ones and that will only come in the final third."